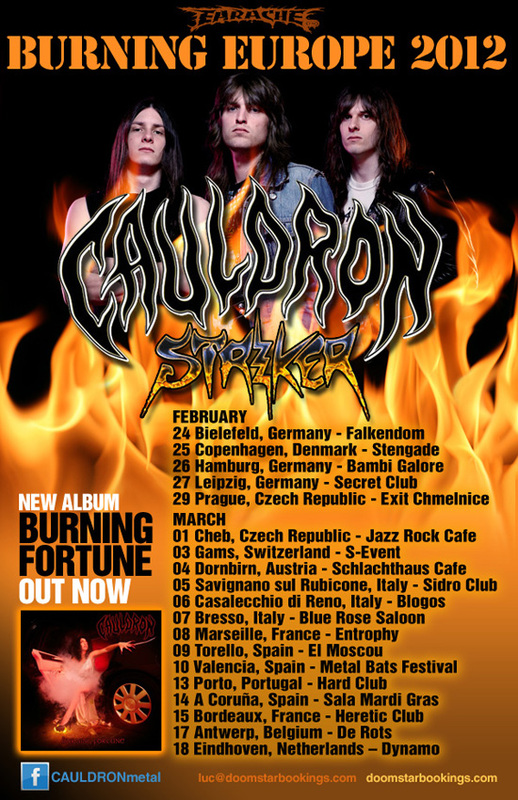 Canadian heavy metal trio CAULDRON will kick off their headlining European tour tonight - Friday, 25th February - in Bielefeld, Germany. The band will be headbanging around Europe for 3 weeks on the "Burning Europe" tour in support of their latest album, BURNING FORTUNE. Joining them on the road are fellow Canadian metallers STRIKER. "Just packing up here in Toronto and getting ready to leave Canada and go burn Europe for a few weeks. We're really looking forward to this as it's long overdue! We've been working on some new stuff for the set; stuff we never played before and some new material as well. Sorry to the fans in the UK, Sweden, and Greece who have been bugging us to come back, we tried to but it was beyond our control. Come party with us in a nearby country... It's sure to be a good time with us and Striker. And bug your local promoters for next time! I'm brewing up a nice hot one right now to drop on a ledge as soon as we arrive in Germany, beware!"